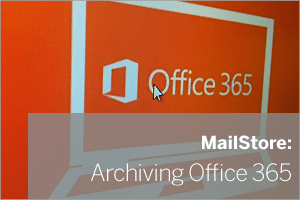 Archiving Office 365 with MailStore just got even quicker! If you’re using Office 365, or one of the many hosted Exchange variants available today, you may be aware that MailStore has long been able to give you a complete and automatically synchronised off-site copy of your mail. I’ve always been happy recommending it as a solution, Office 365 outages happen so it is popular among our customers, however when my colleagues over in the German development team at MailStore let me know about their recent breakthrough in the latest version, I could immediately see the potential for hosted Exchange customers. So whichever version of MailStore you’re using, the way you approach archiving your Office 365 accounts is actually the same. Just so you’re vaguely familiar with the process, I’ve pulled together a rough and ready diagram below to illustrate how MailStore uses one ‘multiple mailbox’ job to connect to Office 365 as a user with ‘impersonation rights’ in order to request the data in every mailbox. I won’t go in to it here in more detail but if you’re interested in the exact steps see the official MailStore Setup Guide for Office365. Before this latest release of MailStore, you would use a single user ‘mailbox’ job to connect to Office 365 and synchronise the mail folder tree. Only once this was updated was it able to then start sequentially looking through the folders for new email. On a typical mailbox this would normally take a minute or so while every folder is checked, new messages archived and those already in the archive are skipped. You could be looking at 30 minutes or so for a typical 50 user site. Because this has some impact on network load I tended to recommend this was only run once a day and typically overnight.. In the latest version 9 of MailStore, the developers have been hard at work behind the scenes re-writing the way the mailbox synchronisation works. The change revolves around the fact a local cache file is now created in MailStore for each user mailbox when it first gets archived. In a similar way that Microsoft Outlook connects to a mailbox, this local cache file remembers what each folder contained at the last sync and most importantly the number of new messages in the sub folders. Now when the archive job re-runs, MailStore can quickly compare the cache file locally against the Office 365 mailbox and establish if there are any changes. The overall effect of doing this dramatically speeds up the mailbox archive process and some large mailboxes that might have taken 10 minutes to re-archive, now may only take a few seconds. Because the average set of accounts now only takes a few minutes to bring up to date, instead of once per day, I now recommend customers run jobs continuously using the new ‘Automatic’ mode. An added benefit of running this job more often is that less data is changing which speeds up the jobs further. It also spreads the network impact over 24 hours which means it’s usually negligible. Is there still a need to ‘journal’? Just as a refresher, when you journal in Exchange for example, you are creating a dedicated mailbox into which a copy of every incoming and outgoing mail is automatically placed, ready to be picked up by MailStore. This is explained in more detail in one of my previous articles. In the past, relying on MailStore to connect to mailboxes directly would leave a window of time where a message could be tampered with, be it accidentally or deliberately. Now that window is so small that it’s less of an issue. To journal in Office 365 is a bit of a pain in my opinion (and some other’s!) because at the time of writing, Microsoft won’t let you store the copies of your mail in an Office 365 mailbox. Instead you need to enter the email address for an external mailbox to which you’d like copies sent to. Not the most elegant of solutions. In summary, there’s no need to journal unless you need a solution that is audit compliant, such as those companies in the financial and legal sectors. MailStore will run quite happily on a desktop machine for test purposes so I’d recommend grabbing a copy of the trial and connecting it to a few accounts. Let me know how you get on in the comments and as always, if you’d like any help, please feel free to get in touch.